Spring has finally arrived, and many of us are thinking about cleaning the house, throwing out the clothes that are outgrown, and generally shaking things up. 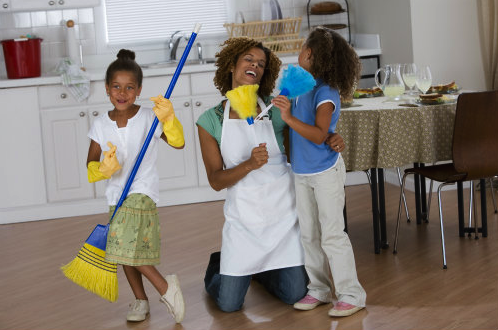 We think it’s a good idea to involve the whole family in cleaning and spring cleaning, even the youngest children. But how do we assign and manage chores? Here are some pointers for getting your children involved. Chores can be good for your children. In fact, chores can teach some basic life skills including planning, responsibility and the importance of completing tasks. They also allow children to contribute their skills to the family pool of assets, which can boost a sense of belonging and self-worth. (Read a bit about the psychology behind it here). It is, however, important to choose age appropriate chores, so children feel empowered and not overwhelmed by the task ahead. We must also differentiate between basic life skills that children should learn as a matter of course, and assigned chores that they can, ideally, choose to complete. For instance, for a toddler, brushing their own teeth and getting dressed by themselves is a development milestone that should be encouraged, but not forced. However, making the bed and cleaning out the dustbin, or feeding pets, could be a voluntary chore. Researchers also think it’s better not to give incentives such as pocket money for doing chores that contribute to the household. Instead, talk to children about the way in which their help can contribute to the family workload, and that it makes them a valued member of the family unit. Also be sure to reward smaller children with lavish praise and encouragement, and remind them how much their effort means to you. Older children might benefit from a chore chart, that you can discuss and draw up together. This will help them to feel involved, and allow them to take responsibility for the process. Remember to reassess chores and responsibilities as children grow. Do your children help out around the house? Let us know what they do, on Facebook or Twitter. This entry was posted in Parenting, Xander Blog and tagged chores, earning, house work, kids, learning, Parenting.